Choosing a suitable wedding car for your big day can be a difficult decision. You want a vehicle that will be reliable, comfortable, attractive and prestigious. 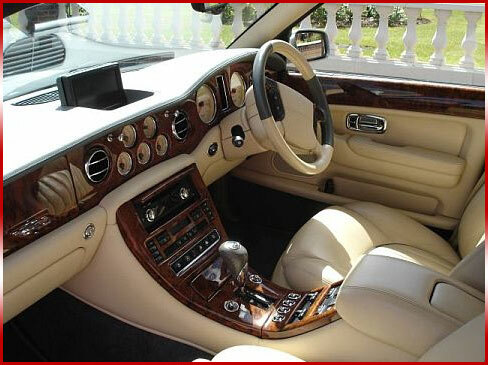 Well the Bentley Arnage has those qualities in abundance and then some. The Bentley Arnage is a beautiful looking vehicle and makes the perfect backdrop for any of your wedding day photographs. Bentley vehicles are hand crafted in the UK and have a 90 year heritage that is difficult to match. The Bentley Arnage is an awe-inspiring vehicle which you don't see on the roads everyday, which adds to the Bentleys allure and is sure to make jaws drop on your wedding day. The Arnage is one of the most powerful and fastest saloons on the market and the interior of the Arnage comes with all of the luxury mod-cons that you can think of. The Arnage has more than enough space to make your journey to the church on your big day a comfortable one, whilst you are wearing your beautiful wedding dress. For the hot summer months the car has climate control, ensuring that when you arrive at your wedding you will be cool, calm and collected. Midlands Limo Hire have been providing wedding vehicle hire for some time and have gathered a great deal of experience over the years. We understand that planning for a wedding can be a stressful experience, however, when you choose us to provide your wedding vehicle, you can be rest assured that we will be reliable, punctual and your vehicle will be impeccably presented. Your chauffeur will be uniformed, polite and courteous and we will endeavour to provide you with the highest level of customer service available. 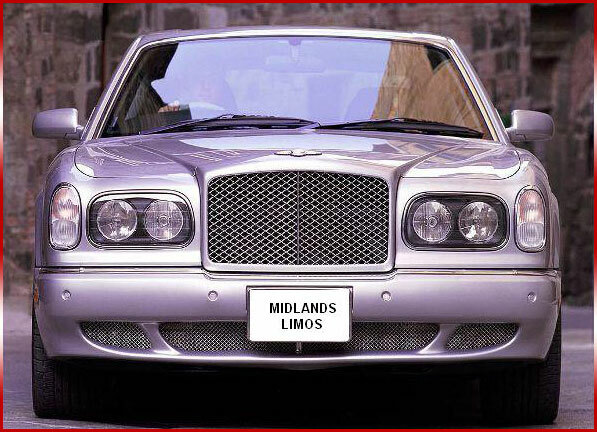 Midlands Limo Hire have a fleet of modern vehicles to choose from, which includes several Bentley limousines. The Bentley limousine looks great when working in conjunction with any of our Bentley wedding cars and makes the ideal wedding day transport for your bridesmaids, enabling your entourage to arrive at the church together and on time. The Bentley is the epitome of comfort and luxury.The ideal wedding car hire.